The most common reason why people see their dentist is to find relief from tooth distress or discomfort. When you’re suffering from toothache pain, an extraction may seem like the best way to go. In most cases, however, it’s better to either save a tooth or restore it altogether, as an extracted tooth can lead to further problems down the road. When a tooth is extracted, it leaves behind an empty socket that takes time to heal. During this period, your mouth is at heightened risk of infections or excessive bleeding. Your teeth experience stress from several directions while you’re chewing your food. Not only do they work up and down, they also move side to side. This means that, when one tooth is missing, those surrounding it have less support. In time, this can lead to more lost teeth. Tooth loss is more than a physical problem. It can also affect your confidence and self-esteem. Like it or not, the world judges us by our smile. 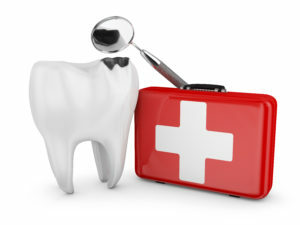 Dental problems can cause you embarrassment and limit your business and personal prospects. Brushing or flossing more often. Sometimes all that’s needed to save a distressed tooth is to pay more attention to your oral hygiene. Your dentist may recommend a new brand of toothbrush or floss string or coach you on proper brushing and flossing techniques. Dental sealants. The dentist applies a special medical-grade protective coating to your teeth, especially those areas that are in contact with your food. The product helps to keep decay-causing bacteria at bay. Crown and bridge therapy. A crown is a special type of restoration that sits atop the base of a distressed tooth. The dentist gently files away the damaged portion of the tooth and applies a protective crown over the top. A bridge spans the gap left from a missing tooth, helping the patient to speak, chew food and perform other common tasks. For many people, the idea of wearing dentures stirs up images of aging and poor health. In reality, you might be surprised to know that many denture wearers are in extraordinarily good health and are not that old. Ask your dentist about implants-supported dentures, which require no messy adhesives to hold in place. Dental implants. Unlike other forms of restoration, an implant fuses with the bones of your face and jaw, through a natural process called Not only can this prevent bone and tooth loss, it can also enhance your appearance and enable you to eat a nutritious well-rounded diet. All of us only have one set of teeth. Safeguarding the ones we’ve got is important for living a happy, healthy life. Talk to your dentist about the preventative and restoration options discussed in this post during your next appointment. The team at Canton Park Dental can provide a wide range of preventative, cosmetic and restorative therapies for their valued patients. Canton Park Dental is one of the highest rated dentistry facilities in Attleboro. You can reach the office online or by calling (508) 222-5950.